This stylish little shed offers a traditional, timeless design. What it lacks in width it certainly makes up for in height. Compared to the majority of other similar sheds, the apex roof on this one has quite a short design. This doesn’t affect its supreme water resistance qualities however. Overlap cladding features throughout, offering a rustic and reliable style. It also makes this shed very affordable. Whilst it can be prone to warping, when treated properly you should find this shed looks as good as new for many years to come. A large, styrene glazed window provides a great source of lighting and also adds to its aesthetic appeal. The Shed Store also offer a solar light panel as an extra which can help to light the shed at night. The manufacturer has added pressure treated floor joists to increase the floor’s strength. The solid sheet floor is also really thick in comparison to other buildings which means you will not have to upgrade it. A pad bolt secures the single ledge door, though you will need to buy your own padlock. 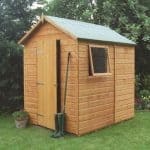 Overall this is a very high quality little shed that when compared to its competitors, comes with some pretty impressive features. Not as durable as Shiplap or tongue and groove sheds. However, considering its low cost, the building does come with a 10 year anti-rot warranty. 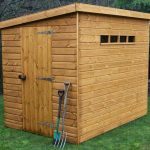 This is a small, stylish apex storage shed, designed to hold your gardening essentials. As part of the Shed-Plus range, it has been developed to a high standard. Due to its compact size, it is only suitable for use as a storage facility, rather than a workshop. It comes complete with a floor and benefits from extra height compared to other similar buildings. One of the main features the Shed Store advertise with their range of sheds is that they are taller than most other competitor sheds. Whilst the height of the door may be a little short for someone measuring six foot tall, inside the building there is plenty of headroom thanks to the apex roof. The door width is also pretty spacious, ensuring you have more than adequate space to add bulky items with ease. It has a deeper design with a fairly short width, making it especially ideal for longer gardens. The shed comes with a short yet sharp apex roof. This means it offers very effective water resistance. It is also covered with a black sand felt, boosting its waterproof design and also protecting it from debris which can get blown onto the roof in high winds. What’s really great about this roof style is that it increases the amount of height inside the building. 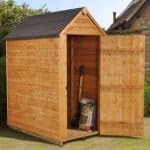 The Shed Store have created this particular range of sheds with a taller than average design, giving you more height to store even the tallest of tools. Like the rest of the building, it has an 8mm thickness and it created from OSB materials. We typically find that manufacturers use OSB for both the floor and the roof when creating overlap sheds. That’s why we’re pleasantly surprised to see this one uses a higher quality square board. Measuring 16mm thick, it has a sturdy feel and it also benefits from pressure treated floor joists. 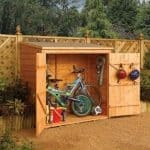 This is a unique feature exclusive to Shed Store’s range of sheds and helps to ensure you are getting the best quality for the low price you pay. Overlap is generally known as the most affordable, yet weakest type of cladding. It is prone to warping if assembled in an area with high levels of direct sunlight. However, it does still provide a reliable and strong design. The key is to ensure it is treated correctly. Provided you do maintain its treatments, you will benefit from a strong, weather-resistant building. There’s one thing that really sets overlap sheds apart and that’s the rough-sawn style. It has the same design as garden fences and in our opinion offers a very authentic look. Each one of the panels fits slightly over the top of the next, creating the familiar ‘overlap’ design. Otherwise referred to as unjointed cladding, overlap offers a rustic design that will look great in any garden. It maintains a standard wooden frame of 28mm x 28mm, which for this size building is incredibly supportive. You are reassured that the structure will remain strong and tall regardless of what the elements throw at it. So whilst it may not be as naturally durable and water-resistant as tongue and groove cladding, it does manage to provide a sturdy, affordable building that will last for years. One of the best advantages of this shed is that it has already been factory dip treated. Whilst the Shed Store do recommend treating the building again after construction, it isn’t essential. This is very unusual and can help to save money if you’re on a budget. It also speaks volumes about the quality of the overlap used. You’ll find that most overlap sheds require annual spirit based treatments in order to maintain a high quality design. So the fact this doesn’t is a major benefit. Of course, annual treatments will boost its longevity so if only for peace of mind, it could still be worth doing. A 10 year guarantee against rot is provided for maximum reassurance. A single door is included on the shed and it has a strong ledge design. It isn’t braced, though this isn’t surprising given its low affordable price tag. It wouldn’t be overly difficult to brace it yourself and the benefits of doing so would prevent it from sagging. On the plus side, it does have quite a wide design so this helps to make storing various sized equipment and tools really easy. A fixed shatterproof styrene glazed window is also provided. Located on the side of the building, it lets natural lighting into the shed for better visibility. Another benefit of styrene is that it is safer and stronger than standard single glazing. So this makes it tougher to break through. Security is the only thing that isn’t really focused on with this shed. A pad bolt on the door may be useful at stopping young children entering the building, but it doesn’t make an adequate lock. Instead you will need to buy a padlock separately. However, this isn’t too much of a problem because the Shed Store provide a fantastic quality padlock as an extra. We highly recommend investing in this as it will ensure whatever you choose to store is totally safe from burglary. Privacy isn’t brilliant either and unfortunately there isn’t much you can do about it. The overlap cladding is not thick enough to hold the weight of curtain poles. So hanging curtains and blinds isn’t an option. However, provided you do invest in the high security padlock, the lack of privacy shouldn’t cause too many issues. You have a few great customisation options available with this building. Firstly there’s a unique, useful solar light which can help make it easier to use the shed in darker conditions. The window provides a small amount of light into the building, but that will only help when it is light outside. The solar light runs off renewable, natural energy. So not only does it cost absolutely nothing to run, but it is also better for the environment. It’s also extremely affordable and much less expensive than an electrical pack. There are also two DIY coloured treatments available. Choose from either Harvest Gold or Dark brown. At just £7.99, these fast drying treatments help you to add a stylish, personalised finish to the building. Each tub contains 5L and they are specifically designed to treat rough-sawn timber. Finally there’s a guttering kit, which can further help with water drainage; helping to extend the life of the shed. This affordable kit attaches slightly below the roof, stopping any water from running onto the actual sides of the shed. As it drips off the roof, it falls into the gutter and then is channelled down onto the floor. Along with the great customisation options, the Shed Store also has a great collection of extras. 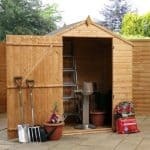 The 6×4 wooden DIY base kit is recommended to ensure you are erecting the shed on top of a firm base. This particular base is built from timber that has been pressure treated in accordance with FSC regulations. It comes with timber spikes which attach into the floor, helping to keep the base grounded. All fixings and instructions for assembly are provided and it is constructed to last for years. Although there is a pad bolt attached to the shed’s door, there isn’t an actual lock. Therefore one extra you’ll definitely benefit from is the security alarm padlock. This is one of the best padlocks we have come across. If anybody tries to tamper with it, an alarm sounds and will only shut off once movement and vibrations are no longer detected. It comes with three keys and has a very sturdy design. There’s also another security extra available in the form of the Yale Security Kit. Yale is one of the leading names in the lock industry so you can guarantee this is a high quality alarm system. It comes with a hasp, padlock and alarm and all of its parts are covered by a year’s warranty. Other extras available are designed with storage space in mind. There’s a great Tool-Plus tool rack which can hold more than 30 different tools. Or you can invest in high quality hooks and a great shelving storage unit. We rarely award overlap buildings such a high quality rating. However, this one is well deserving of its 9/10 mark. The floor is the standout feature here, measuring 16mm thick. Obviously compared to tongue and groove, overlap doesn’t feature as much natural longevity. However, one thing we like about this shed is that the Shed Store have dip treated it before shipping. The thickness of the floor is also better than you find on a lot of sheds with solid sheet floors. So taking these factors into account, you have a very long lasting shed. There’s a generous level of interior space; particularly in terms of height. However, you cannot install shelving on the interior walls so this is something to be aware of. It’s a small building, but you will still be able to fit a lawnmower, bicycles and general gardening equipment inside. The shed is easy to put together and thanks to its smallish size, it shouldn’t take that long to erect. Everything you need is provided and with 2 people it should be a breeze to assemble. You can also make it easier by investing in the DIY Base Kit. As treatment after construction isn’t essential, you are provided with great value for money. Even if you spend a little more on the extras available, you will still be receiving outstanding value considering the benefits they provide. 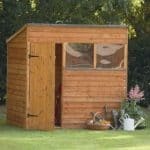 Final Thoughts: While this is a pretty simplistic shed, it boasts some pretty outstanding features. Boasting a great 10 year anti rot and decay guarantee, it is dip treated prior to shipping for great longevity. This minimises the amount of maintenance needed, whilst saving money at the same time. The wide single door provides generous space to manoeuvre items in and out, whilst the apex roof provides pretty impressive additional height and water resistance. The fixed styrene window offers good lighting, whilst also boasting a shatterproof design. 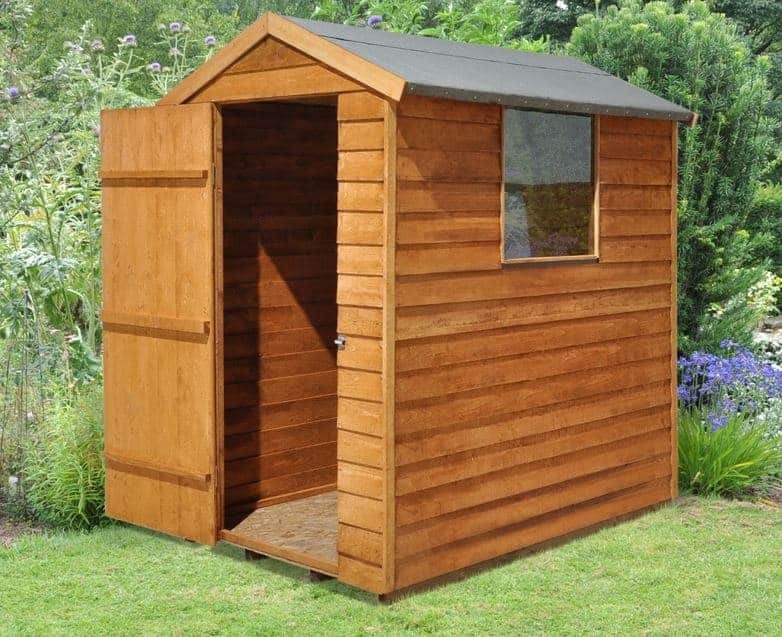 Manufactured in the UK, this is a very high quality, long lasting shed suitable for all of your gardening essentials.